Blended learning is not the same as technology-rich instruction. It goes beyond one-to-one computers and high-tech gadgets. Blended learning involves leveraging the Internet to afford each student a more personalized learning experience, including increased student control over the time, place, path, and/or pace of learning. What are the most common models of blended learning? 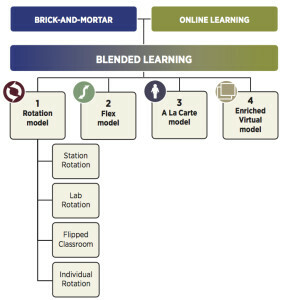 The majority of blended-learning programs resemble one of four models: Rotation, Flex, A La Carte, and Enriched Virtual. The Rotation model includes four sub-models: Station Rotation, Lab Rotation, Flipped Classroom, and Individual Rotation. This taxonomy will evolve as the practice of blended-learning matures. Read the definitions of the models and sub-models here. The Blended Learning Universe—or BLU—is a comprehensive online hub packed with blended-learning resources. Whether you’re looking for a primer on the basics or want to dive deep into the supporting research, the BLU has you covered. 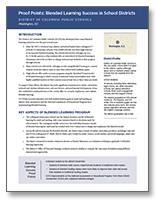 Curated by the Clayton Christensen Institute, the BLU offers a wealth of resources—including practical guides, video tutorials, and downloadable worksheets—and a searchable school directory of K–12 blended-learning programs worldwide. Our goal for this site is to provide meaningful information and tools for practitioners, policymakers, parents, and innovators—really anyone working to improve education through personalized, student-centered learning. Explore the BLU here. There’s plenty of buzz around blended learning and its transformational potential. But what does it really mean? You can now get the inside track on this growing movement by participating in our Blended Learning MOOC—a massive open online course—taught by our own Michael B. Horn, Brian Greenberg of Silicon Schools Fund, and Robert Schwartz of the New Teacher Center. The course is available on Coursera and Khan Academy and is free and open to anyone, anywhere. It is also available in Portuguese and Japanese. 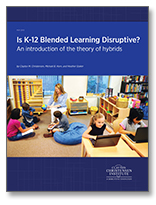 Many in the field pose the question, does blended learning work? 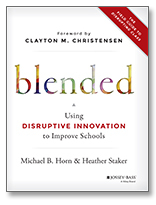 The truth is, the efficacy of blended learning greatly depends on its specific implementation and the particular problem it is designed to solve. The more pertinent question we should ask is what blended-learning model works, with what software, for which students.